Perth Amboy is hosting one of the largest Xtreme Jeep events on the East Coast. Perth Amboy Mayor Wilda Diaz (far right) will present the King of Kings Champion Award to owner of the most awesome and ourageous Jeep. Zombie Partrol Squad is one of themed Jeeps featured in the event. Over 300 Xtreme Jeeps are rumbling into Perth Amboy, New Jersey, and the fleet of vehicles will park along the waterfront this Saturday, July 14 at 11 AM. PERTH AMBOY, NEW JERSEY , USA, July 12, 2018 /EINPresswire.com/ -- Over 300 Xtreme Jeep vehicles will rumble into Perth Amboy and park on Sadowski Parkway, which adjoins the waterfront, on Saturday July 14 beginning at 11 AM. Members of more than 30 jeep clubs from Connecticut, New Jersey, New York and Pennsylvania are bringing their Xtreme vehicles to the City by Raritan Bay. In one of biggest Xtreme Jeep events on the East Coast, attendees can get close-up views of these outrageous custom, tricked-out and themed Jeep-type vehicles. Admission to the Xtreme Jeep Show by the Bay is free. Sadowski Parkway runs along the City’s waterfront and adjoins Sadowski Park, which has plenty of playground equipment for children. Owners of Jeep-type vehicles can still register their vehicles and participate in the event. The rain date for the Xtreme Jeep Show is July 28. The Xtreme Jeep Show is sponsored by the City’s Business Improvement District (BID), 1st Constitution Bank and the Perth Amboy Jeep Club. Among the trophies, the owners and jeep clubs are competing is the highly coveted King of Kings Champion award, which Perth Amboy Mayor Wilda Diaz will present to the winner. 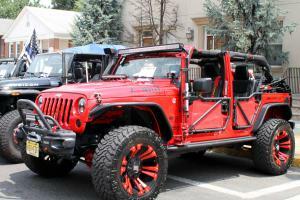 Members of the Perth Amboy Jeep Club will bring 40 incredible vehicles to the event. Jeep clubs and their members take deep pride in maintaining, equipping and customizing their Xtreme vehicles. Each Jeep will arrive completely detailed with metal exteriors, custom equipment, rims, windows and mirrors and chrome-plated engine parts glistening in the sun. One of the most popular Jeeps is the Zombie patrol vehicle, and the exhibit features a number of themed, all-terrain units. Jeep owners also present exhibits showing how their vehicles can roll over or conquer even the most difficult obstacles. children. Throughout the afternoon, people may stroll along Perth Amboy’s beautiful waterfront, relax in Sadowski Park, visit the downtown shopping district or have a late lunch at one Perth Amboy’s many, affordable restaurants. There is still time for Jeep owners to register and display their vehicles on July 14th, and the fee is $20.00. For more information, visit Perth Amboy BID’s Facebook or contact the BID’s Executive Manager Junel Hutchinson at 732-826-0290, ext. 4048 or by email at JHutchinson@perthamboynj.org. The Perth Amboy BID serves local businesses, property owners, the community and visitors by scheduling and presenting a special events throughout the year. Activities include business seminars, skill building programs for employees, and such festivals as the Taste of Perth Amboy. The BID also provides façade grants to small businesses that make permanent improvements to their storefronts or buildings. In addition, the organization helps maintain and enhance the City’s streetscapes by installing information kiosks, planters and directional signs as well as seasonal decorations. For more information, contact BID Executive Manager Junel Hutchinson at 732-826-0290, ext. 4048 or jhutchinson@perthamboynj.org.